Learn about the anatomy of your teeth and gums. All of us grow two sets of teeth in a lifetime. The early milk teeth start appearing at around 6 months old. At the age of 6 or 7 the adult teeth start growing, replacing milk teeth one by one as they push through the gums. Wisdom teeth usually arrive in our late teens or early twenties, but may not appear until much later or even not at all! The maximum number of teeth you can have is 32, although as we’ve said not all of us will grow this number. A tooth is a bit like a tree — only part of it is visible, and the roots lie beneath the surface. The roots of your teeth extend into your gums and beyond into the jaw bones. Teeth are covered by a hard surface of enamel, which forms a protective layer over each tooth. Nature gives us a good start in fighting decay, as this enamel is the hardest substance in our bodies. This is just as well since below the enamel is a slightly softer substance called dentine, comprising the bulk of the tooth. Enamel has no colour, and it is in fact dentine that gives the tooth its colour. 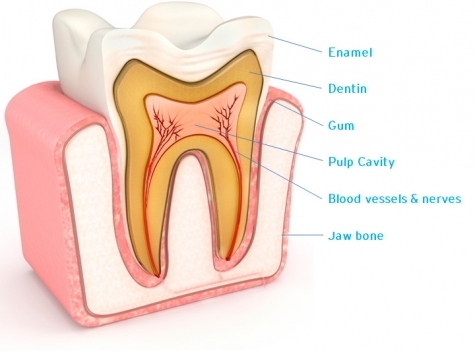 The pulp in the middle of the tooth contains nerves that conduct sensations of hot, cold and pain. The pulp also contains blood vessels. What surrounds the teeth and keeps them in place is more than just the delicate pink flesh we call our gums. It is made up of a group of structures called the periodontium. The treatment of gums and their diseases is called periodontics. Teeth are anchored into the jaw by the periodontal ligament which is composed of bundles of connective tissue fibres. One end of each bundle is attached to the root of the tooth whilst the other end is embedded in the bony tooth socket in the jaw. These bundles of fibres allow the tooth to withstand the forces of biting and chewing. The gingiva is the pink flesh we call our gums. It lies over the bones of the jaw and hugs the tooth tightly at its neck. It is important to remove bacteria from this joining point (gingival margin) to avoid gum disease. The earliest stage of gum disease is called gingivitus. At this stage, gums can become red, inflamed and bleed easily. The later stages, when bone loss and possibly tooth loss can occur, are known as periodontitis.